Are you looking to buy baby formula at your nearest Sam's Club® store? Member's Mark® Infant Formula is exclusively available at Sam's Club locations nationwide. With more than 550 locations nationwide, there is most likely a Sam's Club® in your hometown. Simply enter your zip code and click the button below to find Member's Mark Infant Formulas at a Sam's Club store near you. 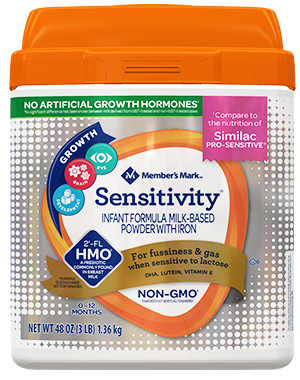 Simply Right™ is now Member's Mark® Infant Formula. 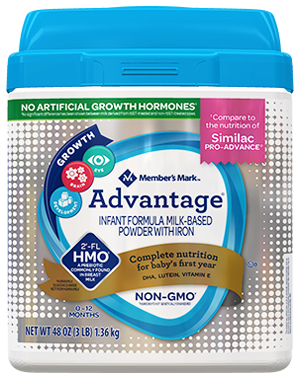 Available exclusively at Sam's Club® stores beginning April 2015, you can find the same nutritionally complete infant formulas at the same affordable prices. Members can save up to $500 a year* with Member's Mark Formula. We have a new look and the same excellent quality. All infant formulas sold in the United States of America meet the same FDA requirements. The Infant Formula Act requires manufacturers deliver specific nutrients and abide by the same safe practices. 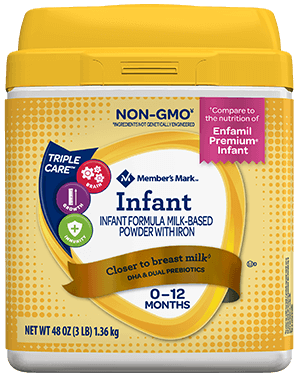 Member's Mark Infant Formulas meet all FDA infant formula nutritional, packaging, and safety guidelines. Paying more for Similac® or Enfamil® does not make sense. Calculate the savings for yourself, buy formula online, and pick it up at your local Sam's Club® store today. Enfamil® is a registered trademark of Mead Johnson & Co. Similac® is a registered trademark of Abbott Laboratories. 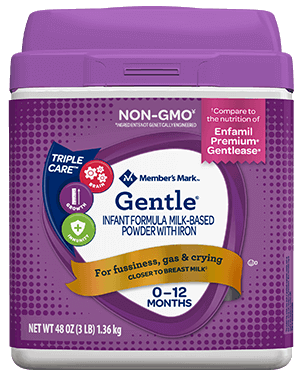 Member's Mark® Infant Formulas are not made by or affiliated with Mead Johnson & Co. or Abbott Laboratories. *Based on October 2017 price study of Member's Mark® vs comparable formulas. See label for full disclaimer.